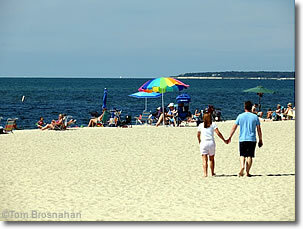 Each of Yarmouth's three villages—Yarmouth Port, West Yarmouth and South Yarmouth—has its pleasures. Yarmouth has lots of beaches—on Nantucket Sound, on Cape Cod Bay, salt-water, fresh-water—and some of them are among Cape Cod's best. Here they are. Drive along MA Route 6A through the northern reaches of the town of Yarmouth (map) and you'll pass the Old Yarmouth Inn and, just east of it, the Parnassus Book Service, in a building which started life as a church and later became a general store. Now the stock is books, including old and rare. No charge for browsing. Across the street from Parnassus is Hallett's Store, a revered Yarmouth landmark, having been here, and in operation, since 1889. Drop in for breakfast, a light meal, ice cream, or a Cape Cod souvenir. Just a minute's walk east is the US Post Office, and behind it are the Botanic Trails of the Historical Society of Old Yarmouth. The trails are open during daylight hours seven days a week year round. Note that these are not formal "botanical gardens," but rather trails through particularly beautiful wild areas of Yarmouth's land and marshes. Local flowers and trees, plants, and geological features are on view, and maps and trail booklets available at the gatehouse where you pay admission will tell you all about what there is to see. Near the Botanic Trails is the Captain Bangs Hallet House Museum, built as a residence by a captain in the China trade. The house's history is as interesting as its Greek Revival façade. The devoted caretaker will fill you in on the confusing chronicle of the house's various owners and reconstructions. The Winslow Crocker House on MA 6A is owned and maintained by Historic New England. The rooms in this Georgian house are furnished with 17th- to 19th-century collections. On the way to Bass Hole (Grey's) Beach (at the end of Centre Street—turn north off MA Route 6A), note the cemetery on your left with graves dating from 1639. South Yarmouth, Cape Cod MA. 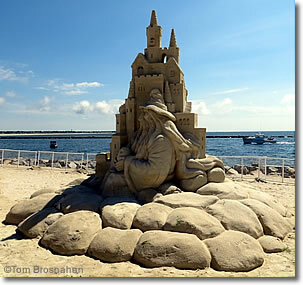 Below, wizard's sand castle at Bass River Beach.